The word “silk” is often associated with the adjectives “smooth,” “soft,” and “lustrous.” However, so is the word “satin.” So, if the terms “silk” and “satin” both refer to that lustrous fabric, are they one and the same? If you don’t know the answer, this article is for you. Silk is made from the larva of silkworms, particularly the Bombyx mori species. The larvae feed on mulberry leaves for about 40 days and then spin a pod around themselves to pupate. This pod is made of a high-protein animal fluid which will then be made into a continuous silk thread. A single cocoon can produce up to a thousand yards of raw silk thread. The silk fabric was originally discovered and developed in China as early as 6000 BC. Nowadays, silk is also produced in other countries such as Thailand, Italy, India, Spain, and France. Silk was originally used for opulent decorations and clothing but is now used for scarves, lingerie, elegant gowns, nightwear, underwear, shirts, home decorations, and even shoes. Silk is famous for its shiny, shimmering finish, a factor that makes garments look and feel luxurious. This shimmering surface is because of the prism-like structure of the silk fiber which causes the cloth to produce a wide array of colors when it reflects light. Moreover, silk is also used by many because it is lightweight but strong, breathable but insulates well, and resilient but comfortable. Silk is also mild on sensitive skin because it is made of natural materials. Fabric made of silk can be expensive because producing silk is a long, tedious process; it needs hundreds of thousands of larvae and a great deal of effort. Artificial silk was invented as a cheaper alternative to real silk, but it did not have the coveted shimmering effect of real mulberry silk. Also, real silk is delicate and requires a lot of care. To lengthen its life, silk should only be hand washed using mild soap and cold water. It should never be wrung, machine-washed, or exposed to direct sunlight. Contrary to popular belief, the word satin does not refer to a type of fiber. Satin is a “weave” or a method of creating fabric. It is created by weaving the threads in a way that certain strands “float” on the top surface of the fabric. These floating threads reflect light, thus creating a glossy finish. In the 12th century, satin rose to fame in Europe, where it was originally done using silk threads. It was very expensive back then until people started to use more affordable types of fiber such as cotton, rayon, wool, and nylon. Nowadays, the majority of the satin cloth on the market is made with polyester. In fact, if you ask for “satin” at a store, it is almost always understood that it is polyester satin. 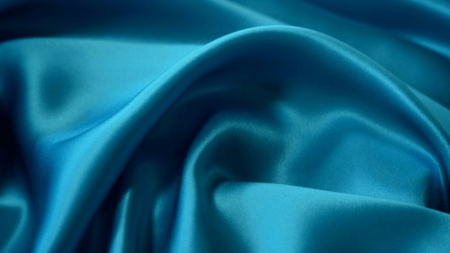 Satin (polyester satin) is extensively used for lingerie, underwear, nightgowns, casual wear, formal wear, gowns, athletic wear, jackets, neckties, ballet shoes, upholstery, bedspreads, and home decors. Satin traditionally has a glossy side and a dull side. Its durability is highly dependent on the base fiber used. For instance, silk satin is delicate but satin made of polyester and nylon is strong, thick, and generally resilient. What, then, is the difference between silk and satin? The greatest difference between the two is that silk is a type of fiber that is produced by silkworms from the species Bombyx mori, whereas satin is a type of weave or a method of making fabric. Satin is not a type of fiber. Both silk and satin have a lustrous look. For silk, the shimmering look is because of the prism-like structure of the fiber that reflects light. For satin, the glossy finish is because of the “floating” threads that reflect light on the surface. Silk is breathable, gentle on skin, smooth, and soft. It is expensive and lustrous on both sides. Satin, on the other hand, is now almost always made of cheap synthetic fibers (mostly polyester). It is typically glossy on one side and dull on the other and can feel rough. It is also more durable and less delicate than silk, which cannot be wrung, machine-washed, or exposed to direct sunlight.